One of the biggest problems people encounter when purchasing clothes from online retailers is making sure the size and length is right so that garments fit as well as possible. Bust & Hips – for tops and trousers, measure around the fullest part of the bust or hips with no allowance for extra fullness. 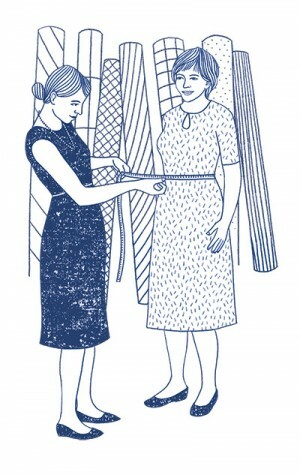 Dresses & Skirt lengths – measure from the top of waistband or nape of neck and down to the hem. Corsetry – measure next to the skin. With skirts and trousers with elasticated waists, remember that the garment measurements will actually be narrower than the measurement on your hips. This is because of the stretch that's needed in the garment waistband to keep the skirt/trouser in place. When you read 'no allowance for extra fullness', this means the manufacturer size will have already factored in space for extra movement in their sizing metric. So, whilst you might have a bust of 36 inches and therefore fit a size 14, the actual garment might measure 40 inches around (the extra movement has already been factored in). The sizes detailed in our catalogues and on the Carr & Westley website are based on British standard sizing and should only be used as a guide. In the event of a garment differing in size, this information is given next to details of the particular piece of clothing. If in doubt regarding your size, please call 01732 850280 to speak to one of our experienced staff at Carr & Westley who will be happy to advise. This entry was posted in Classic Clothing on April 28, 2016 by Harry Burton.